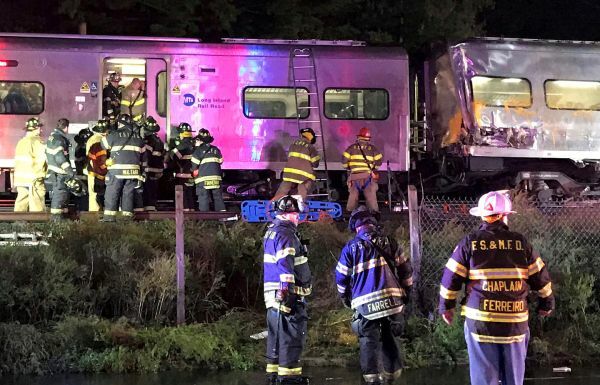 The cause of Saturday night’s Long Island Rail Road collision between a train with 600 passengers and a one-car maintenance train is under investigation. But one lesson is clear. The Main Line of the LIRR needs a third track. The derailment that injured 26 passengers and seven employees spurred a major emergency response and cleanup. Service on the Main Line was out Sunday and severely hampered Monday morning. By Monday evening, the system was repaired enough to allow normal service, until a separate switch problem caused cancellations and delays. Trains ran normally yesterday. Luckily, Monday was a holiday. But the track limitations meant there were no eastbound trains running at all on the Main Line Monday morning. With only one of two tracks open, there was just nowhere for eastbound trains to run. A similar situation occurred Oct. 5, when a rail broke east of Mineola just before the morning rush. About 65 trains were delayed an average of 32 minutes. That served as an opportunity for the Metropolitan Transportation Authority to point out that a proposed 9.8-mile third track between Floral Park and Hicksville would have let the commute run with far less trouble. And MTA officials say routine maintenance would be safer and easier with a third track to handle trains while crews work on the others. The LIRR is the busiest commuter rail line in the nation and an economic engine for the region. Building a third track will be a short-term inconvenience, but it will also bring improvements, like the elimination of busy grade-level crossings. It will make the LIRR run better every day. And it will particularly do so on the railroad’s worst days.